Place chicken on grill over medium heat. Cover grill; cook 3 minutes. Turn chicken; brush with barbecue sauce. Cover grill; cook 5 to 7 minutes longer or until chicken is no longer pink in center. Remove chicken from grill; top each with 1 cheese slice. Place buns, cut sides down, on grill. Cover grill; cook 1 minute or until buns are lightly toasted. 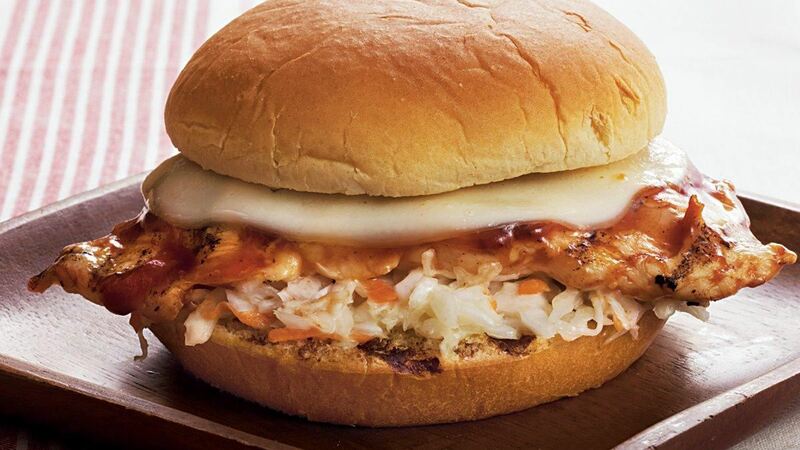 Spoon 2 tablespoons coleslaw on each bun bottom; top with chicken. Cover with bun tops.